This particular verse reminds us that as believers we are not to fear. The comforting exhortation to “fear not” or “do not fear” occurs 365 times in the Bible, indicating a daily memo from God that we are to have no fear. Isaiah 41:13 also provides great encouragement with this reminder. When we encounter stressful situations that cause us to respond in fear, we are encouraged to seek the strength to overcome any obstacle that attempts to block our path to success. Psalm 27, my favorite psalm which I committed to memory as a youngster back in the middle of the 20th Century, still offers great encouragement today. 8When thou saidst, Seek ye my face; my heart said unto thee, Thy face, LORD, will I seek. In the midst of the perilous times in which we live, we cannot deny that fear seems to abound. We all recognize that fear is a common and natural emotional response to potential danger, but if not properly addressed, it can become a deadly emotion with serious consequences. Excessive fear can become crippling and impact our daily lives in a negative way. Unbridled fear is a toxic emotion that limits and inhibits. The acronym used in the poem is a common one for fear as “false evidence appearing real.” Last year I was introduced to another acronym for fear by Victoria Dunn: “forgetting everything already realized.” That concept inspired another poem containing yet another acronym, as well as another based on the antidote to fear: Love ( Love Overcomes: this Victory we have Every time). The Verse of the Day is just a reminder for believers to put on our “no fear gear,” as we walk in the love of God which casts out all fear. As we reflect upon Psalm 27 and other passages related to having no fear, here is a musical reminder composed by Andraé Crouch and Michael Omartian; this version of Psalm 27:1 features vocal soloist El DeBarge. This song recorded by Sweet Honey in the Rock caused me to think about whether there are any mirrors in heaven. After attending this life-changing conference, I wanted to share some of my thoughts in this blog entry. Almost two weeks have passed since the “It’s All about Relationships” Conference 2013, a powerful life-changing experience that I am still endeavoring to process and understand all that transpired. 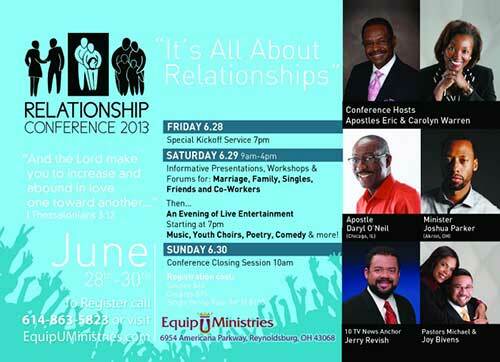 Hosted by Apostles Eric and Carolyn Warren of Equip U Ministries in Reynoldsburg, OH, the three-day event offered informative presentations, workshops and forums designed for married couples, singles, friends, co-workers, teens and senior citizens. In addition to the conference hosts other speakers and workshop leaders included Pastors Michael and Joy Bivens, Apostle Daryl O’Neil of Chicago, IL and Minister Joshua Parker of Akron, OH. Dane Findley, health writer and wellness coach, commented that “Paying close attention to the relationships in your life is not an extracurricular activity — it’s the reason for life itself.” Indeed, the conference helped to bring clarity and a greater understanding of the magnitude of the fundamental relationship principles that govern all of life. Verse two of Genesis 1 beginnings with conjunction “and,” the most frequently used word in the King James Version of the Bible, being used 28,364 times. The figure of speech known as polysyndeton involves using “many ands” where is there is emphasis placed on each item listed in any series connected by the conjunction. This figure is particularly noteworthy in Genesis 1:2 and the verses that follow.